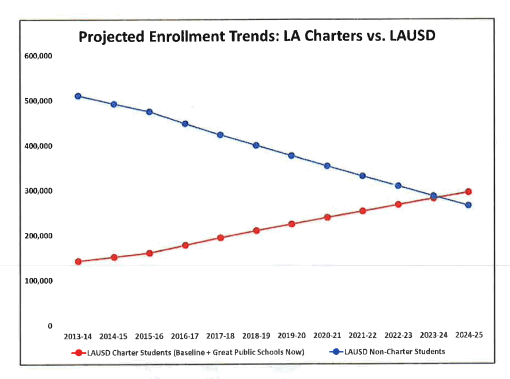 Broad's plan to claim half of Los Angeles schools over the next 8 years for corporate welfare charter companies is specific in its grandiosity. See Part 1 here. The first chart below shows the Broadie vision for how paternalistic "no excuses" charters will replace the most vulnerable public schools. By 2023, Broadies expect the number of charter students in corporate reform schools to outnumber those students in public schools. As apartheid charter schools replace highest poverty and lowest scoring publics, the number of union members will also decline, as the chart below shows. Notice that maintaining both poverty and standardized testing are critical for this strategy to work. 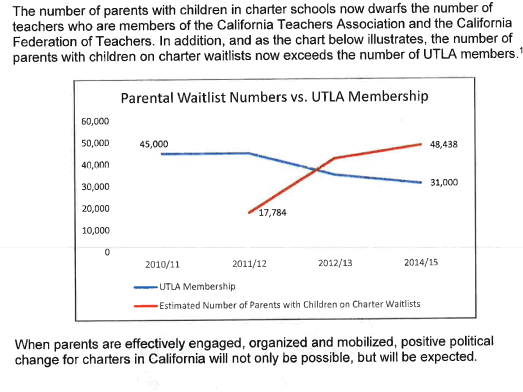 And as the number of charter parents increases, their gathered bodies will become useful tools for the charter public relation machines for exerting political pressure. Note that parental participation "will be expected."